BLOOMINGTON, Ind.--(BUSINESS WIRE)--Following the recent FDA approval of Cook Medical’s Zenith Dissection Endovascular System, Cooper University Health Care in Camden, New Jersey, has treated the first patient in the US with the device as part of Cook’s US commercial launch. The system provides physicians a less invasive alternative to open surgery for repair of Type B dissections of the descending thoracic aorta. It consists of a proximal stent-graft component and a distal bare stent component. Aortic dissection is a tear that occurs between the innermost and middle layers of the aorta. When the inner layer of the aorta tears, blood flows through the tear, which causes the inner and middle layers of the aorta to separate (dissect). Type B dissection involves a tear in the descending aorta. 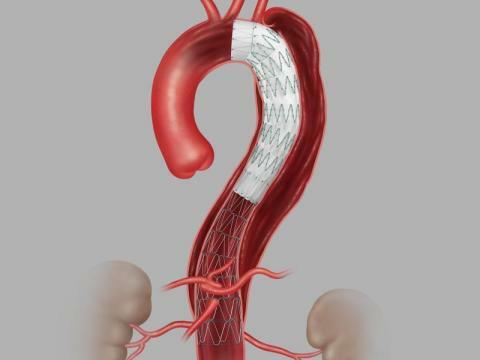 To learn more about Cook’s disease-specific treatment options for endovascular repair, visit cookmedical.com. Dr. Lombardi is the Global Principal Investigator of the Stable I and Stable II Clinical Trials and is a paid consultant of Cook Medical.